I took the tour of Fort Caroline with my kids' school. It was an interesting tour, but I wondered a bit at some of the history being taught, so I researched it on my own. Basically, it's a time of sketchy history, and probably the best accounts are buried in France or Spain, but I figured I'd weigh in on some what I learned. I could tell fairly early that the ranger had an agenda with the history lesson. I'm not totally against this sort of thing, and I suppose it makes the narrative more palpable, but a couple of "facts" that I heard early in the tour made me reconsider other assumptions made by the guide. For example, we learned that Timucuan Indians bathed daily, while Frenchmen and Spaniards bathed once a year. I'd gotten this mass email of "fake history" many years ago. I visited Barcelona and Normandy, and there would have been no reason for anyone there (or in any other Spanish/French coastal region) to bathe once a year. In fact, baths, ponds, and rivers existed all throughout Europe, and people were not idiots. It seems that public bath houses had given way to private bathing, and full submersion was less common than in earlier years, but clean clothes were important (https://en.wikipedia.org/wiki/Bathing#Medieval_.26_early-modern_Europe). Bottom line is that the Europeans would not have bathed as often, yet they held the ideal and perception of cleanliness to be very important. Yes, the Timucuan bathed more often than the typical Spaniard or Frenchman, but the idea of the noble savage continued beyond the first assertion. We learned that, partially because of their seafood diet, the Timucuan were 6 to7 feet tall, whereas the average European was maybe five feet in height. Wow, that's staggering...but not true. While the Spaniards remarked at the height of the tribe, skeletal remains indicate the men were 64" tall (that's 5'4"), whereas the average European at the time was about 65". A couple of possibilities: Timucuan women were 62" and maybe tall enough to tower over European shorties; Timucuan men wore their hair in tall buns that may have added the four inches mentioned in texts; Timucuan were taller than other tribes and their Asian counterparts. However, they were not 2 ft on average taller than the Spaniards. Maybe a few inches. It's just fake history to say it otherwise. Another bothersome comparison that was made was that the Europeans smelled like piss, while the Timucuan were nice and clean. Urine WAS used to clean clothing, but it's not like the Conquistadors got wasted and pissed on each other. Urine turns into ammonia, which all of us use as a cleanser. According to the Smithsonian website, Europeans would have used and known about soap, but they would have continued to use urine to get out tough stains. Perhaps the clothing smelled like ammonia, but it's not like the Spaniards smelled like piss. To suggest that scientific discovery made the Europeans less civilized is really an affront to science. Yes, we can criticize the brutality and ethno-centrism, but we should tread carefully beyond that. Discovering the existence and use of ammonia and urea in urine should not be mocked and diminished today. The Spaniards, possibly the most powerful Europeans at the time, would have worn clean linen clothing, had whiter teeth and softer leather, and gunpowder--all because of the use of the chemistry of urine (https://www.smithsonianmag.com/science-nature/from-gunpowder-to-teeth-whitener-the-science-behind-historic-uses-of-urine-442390/). So it appears there's a bit of an agenda at Fort Caroline. Perhaps the super-tall, good looking, and pleasant-smelling Indians made de Leon think there was magic involved. But there's more. Even though Ponce de Leon's charter said he should look for the Fountain of Youth, he never mentions it in his own writings about his expedition, and it was later historians who claimed he was in search of it. There's also no reference to the relative size or cleanliness of the Timucuan having anything to do with Spaniards believing the fountain was in Florida. In fact, it seems that Columbus had already reported that the Taino Indians in Puerto Rico were tall (de Leon was there, too). 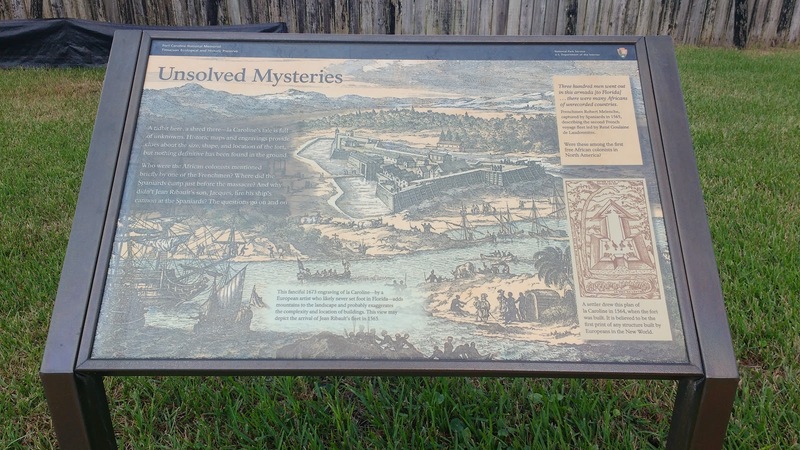 I assume there's even more to the history of Fort Caroline and the Timucuan that could be scrutinized, since there's simply very little to go on. For example, one of the only images of the fort exists as a work by a French artist who added mountains in the background, presumably because he'd never been to Florida. Most surviving accounts are written by the survivors or those back in Europe, all politically motivated. Like, for some reason, accounts today. And then I read that there's pretty good evidence that Fort Caroline is in Georgia, anyhow. Take a look at the evidence on this website. The maps seem to contradict the currently accepted one, and the fact that the French recorded the word being used by the local Indians for "enemy" as "timuqua" is pretty strong. 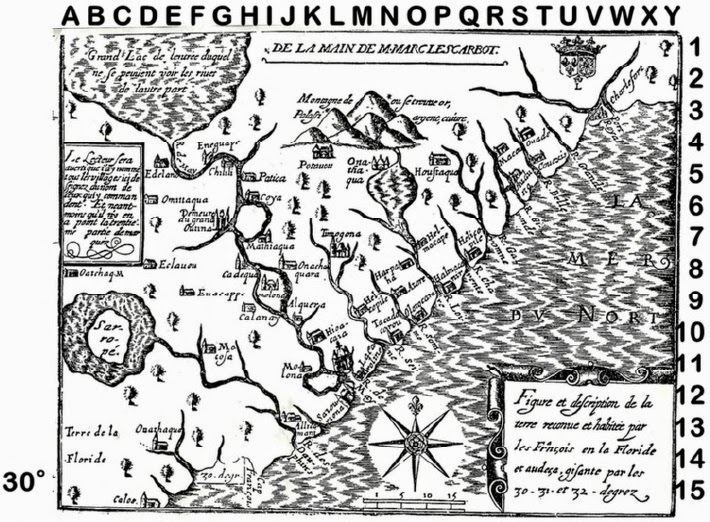 For example, this image from a French map shows "R. de May ou Alatamaha," which means The River of May or Altamaha (in Georgia) is the same river. "R. S. Jean" (St. John) is seen to the south.Click on image for full-size. 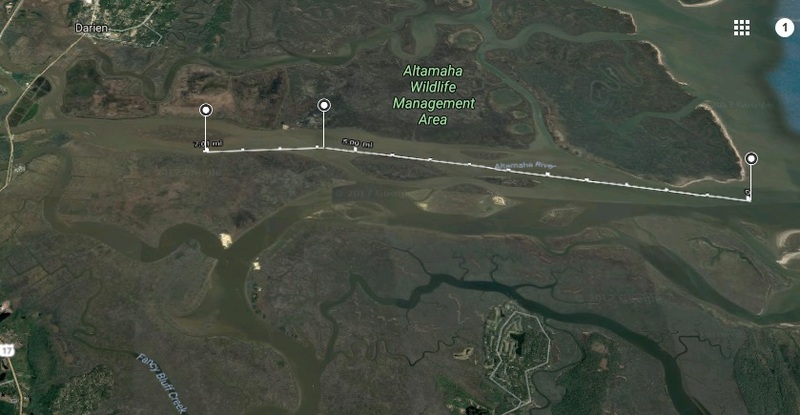 If Fort Caroline really is on the Altamaha, then one source I found said it was 2 leagues in from the mouth, which would have made it roughly where the marker is on this next map. Of course, the measurements could be off, and the river also veers south. I'm wondering what the Seine or Tacatacourou River really was. 15 leagues is around 50 miles. 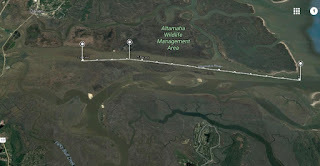 If Fort Caroline is on the St. Johns, then this would be the Altamaha or maybe Fancy Bluff Creek. If the fort was on the Altamaha, then it's the Savannah River, perhaps. And if R. des Dauphins is the St. Johns, then what is Sarrope? If the River May is St. Johns, then the big lake way to the north is really Lake George way to the south, and I can see why the French had trouble with the Spaniards. The Riviere des Dauphins is said to be near Tagesta Island, and the River May is near Port Royal and the Cap Francois, but good luck finding those today. The preceding is from a history book. I'm no historian, but if "the river" is the St. John's, ascending it 60 leagues would have taken Laudonniere to Orlando. Since it's a winding river. The area of Georges Lake and Etoniah Creek seem to be more like 60 miles. Is it leagues or miles? 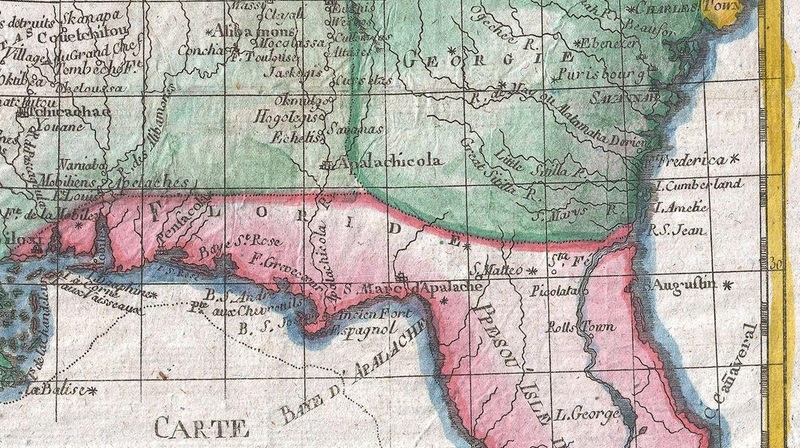 Anyhow, it's interesting that the ranger told the kids there was no corn (maize), but this chief was taken prisoner in order to get food, implying that maize was growing well south of Jacksonville. Assuming that's true, then at least it should be acknowledged by the park. If it's not, then 60 leagues northwest of the same fort on the Altamaha was likely a good place for growing maize.